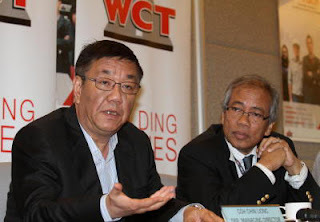 PETALING JAYA: WCT Bhd, which has proposed an internal reorganisation to separate its construction and property divisions, is aiming to grow its property business to be as signficant as its mainstay construction arm within five years. The group's executive director Choe Kai Keong told StarBiz that post-reorganisation, shareholders and warrant holders of WCT would benefit in terms of efficiency, as the move would unlock the value of subsidiary WCT Land. “This move is to streamline the business, and also to unlock the value of WCT Land. We are in a very exciting time for the property business, which will be as big as our construction arm in the next five years,” Choe said. Choe pointed out that there were plans for two more malls, located in the Overseas Union Garden (OUG) area in Kuala Lumpur and Johor Baru, to be completed by mid-2015. They are in addition to the group's Gateway @ Klia2, due to be opened in May 2013, as well as Aeon Bukit Tinggi Shopping Centre in Klang, and Paradigm Mall in Petaling Jaya. Choe said except for the Aeon Bukit Tinggi Shopping Centre, which is leased to retailer Aeon Co Bhd, the other malls were managed by WCT. The five malls would have a combined net lettable area (NLA) of 3.8 million sq ft. There are also plans for four-star hotels and serviced apartments to be built at the mall sites in the OUG area, Johor Baru and Paradigm Mall in Petaling Jaya. WCT currently owns and operates the four-star, 250-room Premiere Hotel in Klang South. “So, five malls and four hotels with a combined 1,430 rooms within the next five years, as well as serviced apartments in mixed commercial developments. This is the direction we are heading in,” Choe said. Last month, WCT had proposed an internal restructuring where a new investment holding company WCT Holdings Bhd, will assume the listed status of WCT. The exercise will also include the transfer of WCT's entire shareholding in WCT Land Sdn Bhd, the group's property development arm, to WCT Holdings. The effective holding of WCT shareholders would be unchanged before and after the proposals. The proposed internal restructuring is expected to be completed by the second quarter of 2013. Meanwhile, the group is on track to hit its property sales target of RM700mil this year, after achieving RM500mil as at end-October. WCT Land general manager of sales and marketing Stewart Tew said that the 1Medini condominium in Johor had contributed about RM300mil in sales this year, with the balance coming from property launches in Bandar Bukit Tinggi townships in Klang. Tew also said the 1Medini strong sales was helped by the completion of the catalytic projects such as Legoland, Newcastle University of Medicine, Family Indoor Theme Park and the Medini area's exemption from restrictions for foreign buyers, such as the minimum floor price of RM500,000 for a residential property bought by foreigners. Tew said the recent launch of The Landmark retail offices (GDV RM180mil), which is next to the Aeon Bukit Tinggi Shopping Centre in Klang, would also drive WCT's property sales this year. On WCT's construction arm, Choe said year-to-date, WCT's engineering and construction arm had clinched RM1.9bil of new contracts. They incuded a RM1bil deal in Oman to build the Batinah Expressway (package two), in a joint venture with Oman Roads Engineering Co LLC., WCT has a 80% stake in the venture. Choe also said the company had tendered for RM3bil projects, consisting of close to RM2bil in Malaysia, and the balance in the Middle East. Meanwhile, at an EGM yesterday, deputy managing director Goh Chin Liong said WCT intended to increase its recurring income from property development and investments. “In our five-year business development plan, we intend to increase the operating profit contribution of the property development segment to 30% (in 2016) from 21% (in 2011),” he said. In 2016, WCT hopes to increase its operating profit contribution from property investment to 25% and that from construction reduced to about 45%. As of 2011, the earnings base of the construction segment stood at 64%. The property development segment contributes 21% to operating profit, and the investment and management segment contributes 15%. At the EGM, WCT shareholders approved the proposed bonus issue and free warrants. WCT has proposed to give three bonus shares for every 20 shares held, which will involve the issuance of up to 180.26 million new shares. Shareholders will also receive one free warrant for every five WCT shares held. Up to 240.34 million warrants would be issued. The bonus issue will increase WCT's authorised capital to a minimum of RM1.1bil, comprising two billion ordinary shares of 50 sen each and one billion preference shares of 10 sen each. WCT's current authorised capital is RM800mil. For the third quarter ended Sept 30, WCT posted a marginally higher net profit of RM40.3mil, or 4.91 sen per share, against RM39.2mil, or 4.87 sen per share, a year earlier. Revenue for the quarter stood at RM441.7mil. For the first nine months to Sept 30, WCT's net profit rose to RM119.8mil on revenue of RM1.18bil.